There are hardly few people who come out of their comfort zone and try to do something extraordinary and achieve something for the country and then for themselves. 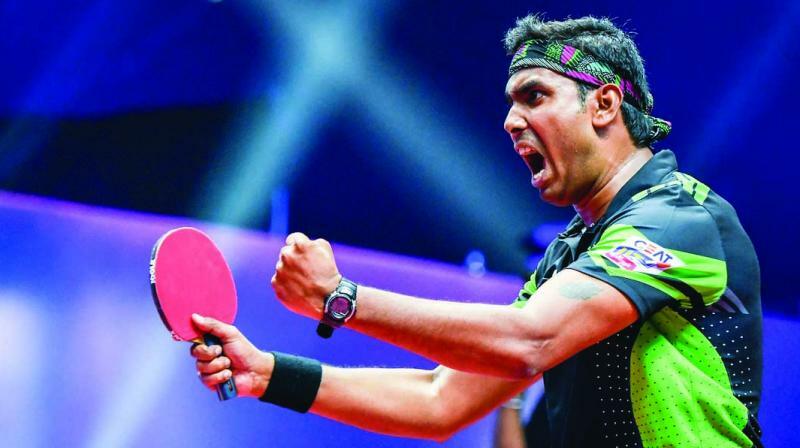 Achanta Sharath Kamal is one such person whom we can definitely look upon as a prime source of inspiration. Born on 12 July 1962 in Chennai, Tamil Nadu, he started playing Table Tennis (TT) at the age of 4. The age, at which it was impossible for him to reach the table height, his parents used to lift him up and he used to knock the ball. In the school days he was a state champion and ranked number 1 in Tamil Nadu but never reached the top level at the national level. His career gained momentum when his parents allowed him to opt for other stream than engineering and due to this he devoted almost 12 hours a day for table tennis. From the age of 15 to the age of 20 he went through rigorous training. Kamal’s hardwork paid off as he finally reached the number 1 ranking in the nation in 2003. He became first Indian table tennis player ever to become nine times Senior National Champion hence breaking the record of eight times National Champion Kamlesh Mehta. He represented India in the 2004 Olympic Games held in Athens. In 2004 he decided to move to Germany to improve his game for 2 years and it changed the results as he won Gold Medal in 2006 Commonwealth Games in Melbourne and also won the Team Gold Medal. This was the time when Sharath Kamal came into Limelight as a star Table Tennis player. He became the first Indian to win a medal in Commonwealth Games in Table Tennis. In 2010 he was in top form and ranked 39 in the world, his best till then. In 2009 Sharath got married and in 2011 he had a baby daughter. There were changes in the game and also many changes in his personal life which affected his game a lot. He dropped down to World Ranking 94, his lowest in his entire career. With the speed with which the game was changing, it was difficult for him to get back on top. He decided to hire a personal coach and dedicate himself completely to the game. He had to keep his family as the 2nd priority so as to focus on the game. There came a moment when his wife stepped up and said that she would shift to her mother’s place and he should completely focus on his game. Sharath says that those were the most difficult days in his life as he had to stay away from his family. Facing hardships and going through tough training, Sharath was sensing the development and progress in him. With extreme hardwork he saw himself in the Top 50 in 2014. In 2015 he played his best table tennis beating 4 out of the top 20 ranked players in the world in Asia Cup. He mainly aimed at 2016 Rio Olympics. If not a medal but at least he wanted to qualify for the Quarter final round to beat his own and India’s previous record of Round of 32. In 2015 World Championships in China, after a healthy 3-0 lead, he suffered a horrible injury in the form of hamstring and torn muscles up to 12cm. He still continued to play the match and went on to win it in the 5th set. This was a major setback in his career as it would require months to recover from this and 2016 Olympics were just 15 months ahead. He somehow recovered and came back to play in November 2015. Slowly and steadily he was coming back to shape and form. Finally in April 2016 he qualified for the Rio Olympics on the last day of qualification winning the intense match 4-3. Unfortunately he lost in the first round, but this qualification gave him a boost in his confidence.